You know you are a parent of a construction loving kid when you not only know all of the characters and the theme song to Bob the Builder™, but you can also drive down the a road under construction and tell the difference between a backhoe loader and an excavator - and worse, you know how to identify the mini, regular and giant versions of said excavator... that's where our family is at right now, so as soon as the new Bob the Builder™: Adventures by the Sea DVD entered our house, it was a big hit in the dvd player! 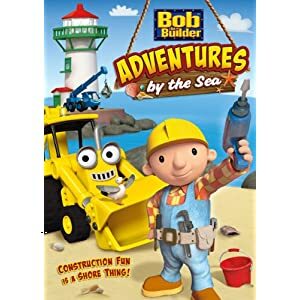 Bob and his Can-Do Crew are having fun in five new, sea-themed adventures in construction in Bob the Builder™: Adventures by the Sea, which sailed onto DVD, Digital Download and On Demand May 22, 2012 from Lionsgate and HIT Entertainment. From facing fears, correcting mistakes, doing good work and always getting the job done, Bob’s the man and when you’re on his team, life’s a beach! My kids love all of the episodes, but I have to say that Scrambler Gets Clean is a personal favorite of mine - considering how tough it is to get Liam into the tub... as usual, the whole DVD is up to the high standards of the Bob the Builder franchise and I know that my kids are learning as well as being entertained! You can win your own copy of Bob the Builder™: Adventures by the Sea (US/Canada) just by answering the question on the rafflecopter form below! You are then welcome to do any or all of the bonus entries! Disclaimer: I received this product at no cost to me for the purpose of completing my review. All opinions are my own.